The truck in GPL’s Water Street, Kingston yard on which the fire started. 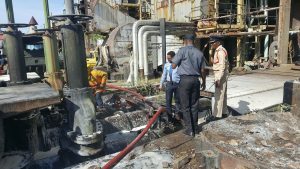 A major fire was Monday afternoon averted in the Water Street, Kingston compound of the Guyana Power and Light Inc. as a result of quick action by staff of Power Producers and Distributors Inc; backed up by support from the Guyana Fire Service, officials said. Fire fighters were investigating that the fire started when a man was welding a truck. That now destroyed vehicle was located a very short distance from a huge fuel tank. Officials of PPDI, which supply electricity to GPL for transmission to customers, said electricity supply was not disrupted during the fire and that was not likely to occur in the aftermath of the blaze that occurred in the yard just south of Barrack Street. Fire Chief, Marlon Gentle told reporters that the “response drill” was activated and so five fire tenders and a foam-laden vehicle were deployed to the scene. 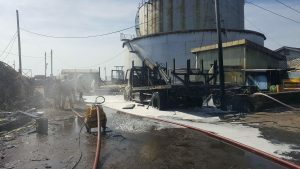 “When they got here, they encountered a truck on fire and the fire had already spread to a holding area that container that contained Bunker C fuel or some type of fuel. We were able to contain the fire, using our resources as well as the in-house fire fighting resources of the company,” he said. A full-damage assessment, he said, would be conducted after all the pipes and other areas have been cooled. Gentle praised the fire fighting response, calling it “robust” and testimony to the periodic drills that are carried out at such facilities. “Definitely, this was not a rehearsal but we were able to do a proper response, a timely response at this facility,” he said. Fire fighters cooling an area at the scene of the fire. The Fire Chief explained that foam was used because of the combination of fire hazards in a small space- fuel, generators, plastics, rubbers and insulations. “It’s a combination of different types of hazards that have to have a different type of intervention. That’s why we are using high-expansion foams that cools and also smothers the fire and it’s also good for hydrocarbons,” he said. A senior PPDI official referred all queries about power generation to the GPL. Sources indicated that GPL’s fire fighting equipment were locked and could not have been accessed readily, and instead the first response came from PPDI staff. At one stage, the security guard at the gate was unaware of a fire at the facility behind the old now defunct Guyana Electricity Corporation generation facility.